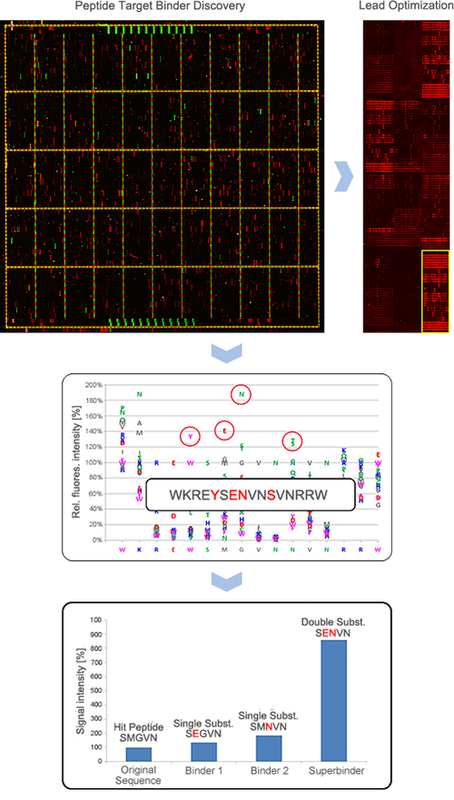 Peptide Microarrays perfectly complement peptide display screens (e.g. mRNA display, phage display or CIS display) in regard to peptide target binder development. With up to 1013 different peptides display screens are outstanding in their peptide library size offering an optimal starting point. They often end with hundreds to thousands of peptide hits, which have to be approved using a second screening method. In contrast to ELISA screens, which are laborious and expensive, thousands of peptide hits can be validated in parallel on a single PEPperCHIP® Peptide Microarray. Binding motifs can be further optimized by Single and Double Substitution Scans to increase the affinity of the peptide target binder. Over 16.000 peptide hits of a display screen are printed on a PEPperCHIP® Discovery Microarray in triplicates (top left). The array is incubated with the tagged target protein and a tag specific fluorescent dye. Peptide hits are selected and further optimized using a single substitution scan (middle) and a double substitution scan (not shown), which strongly increases binding of the target protein to the peptide. Due to the large array format and the associated high amount of data, PEPperCHIP® Discovery Microarrays are exclusively provided along with our comprehensive PEPperMAP® Service.